"I can only think of one experience which might exceed in interest a few hours spent underwater, and that would be a journey to Mars." Rain and wind lash at my Gore-Tex as I make my way up a trail on the island of Ursholmen toward Sweden's westernmost lighthouse. On a fine day, I'd linger to take in the solitude, the salty air, and the stark outer-archipelago scenery. But today the sea is dark and opaque, and the land—a treeless expanse of gray rock and brown and green grasses, with a cluster of decaying buildings—feels like a place where human visitors are tolerated, but only just. Looking seaward, I find it hard to fathom the unseen wonderland beneath the dreary surface. It's quite a change from yesterday, when I biked and hiked under sunny skies on North and South Koster, the archipelago's main islands. I wandered through woodlands and fields to secluded inlets and stood atop the rocky heights of the Valfjäll lookout. That evening, in the Scandinavian summer's lingering twilight, a thunderstorm roared in, rattling the windows of my rustic cabin and illuminating the northern sky with pulses of lightning. These islands, it turns out, are most treasured because of something I can't see: an underwater environment so diverse and unusual that the Swedish government recently enshrined the Kosterhavet Marine National Park—the nation's first such sanctuary. A deep undersea channel to the east abuts shallow waters, creating a string of habitats where intertidal oysters and mussels thrive in proximity to corals, harbor seals, and even an occasional whale. The Koster Islands are located off Sweden's west coast, just south of the Norwegian border and about 100 miles north of Göteburg. With the exception of North and South Koster, which are nature reserves, most of the archipelago is part of Kosterhavet Marine National Park, which covers 153 square miles, nearly 98 percent of them ocean. 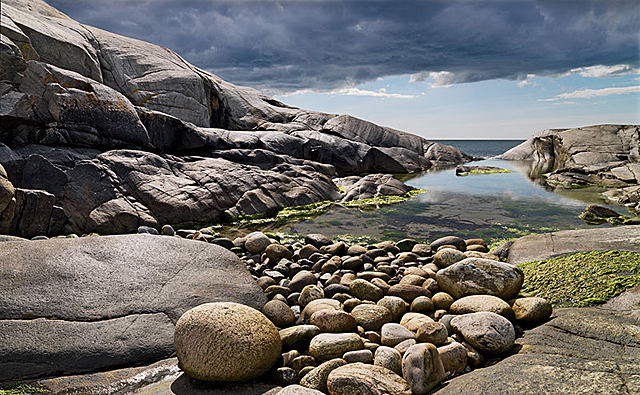 Created in September 2009 together with Norway's adjacent Ytre Hvaler Marine National Park, Kosterhavet is home to an estimated 6,000 marine species, making these waters the most biodiverse in Sweden. On land are an equal number of plant and small animal species, including 1,200 species of butterfly. Unless you have your own boat, access to the Koster Islands is by the Koster Marin passenger ferry from Strömstad on the mainland or on day tours from various locations, including Strömstad, Tjärnö, and Resö. Adventure tourism is a young but growing industry, with hiking, bicycling, boating, kayaking, diving (the best in Sweden), and shellfish "safaris" possible. The two largest islands, North and South Koster, are home to approximately 350 people. There are almost no cars on the islands; for the most part, the only motorized vehicles you'll see are the flatbed scooters that residents use for transportation when feet or bikes won't suffice. Lodging ranges from a limited number of seasonal camping cabins to the year-round Ekenäs Hotel. I stayed at Kostergarden, which offers simple but comfortable self-catering cottages in a tranquil, somewhat off-the-beaten-path location near the Kilesand ferry dock. The on-site restaurant serves a limited but delicious dinner menu prepared by chef Bent Hjorth, one half of the Danish-Swedish couple who manage the property. For lunch I enjoyed the wonderfully fresh buffet at Kosters Trädgardar, an organic garden and restaurant run by Stefan and Helena von Bothmer, who also offer guided walking and biking tours on North and South Koster. The West Sweden Tourist Board and the tourist office in Strömstad (can help with more information and bookings).